When a grand occasion calls for a toast, do it in style with our Golden Elegance Collection Champagne flutes! A grand occasion calls for a grand vintage and your guests will be delighted to raise a toast at your special celebration with these beautiful champagne glasses. Each glass features a classic flute shape with a slender clear glass bowl on top and a long slim base. The base is crafted from sturdy poly resin and has an opulent gold glitter finish. Each flute holds a capacity of 8 fluid ounces. These sophisticated and luxurious flutes come in sets of two. Use for the ultimate romantic dinner, to toast a grand occasion and to offer as favors for guests to take home. 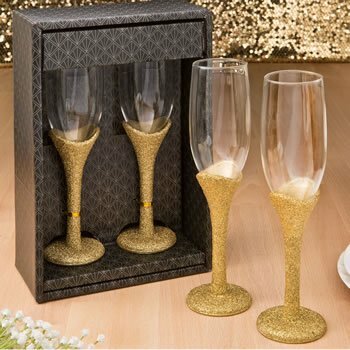 Size 9 1/2" x 2 1/4" x 2 1/4"
A fabulous champagne toasting set for any grand occasion and a great favor for guests to take home!